We offer a broad range of laser engraved products that will suit any donor recognition or corporate need. Whether on the ground, on a wall, or on a boulder you can be assured that your supporters will be honored with the highest of quality . We maintain excellent relationships with manufacturers and distributors across the US enabling us to offer you the best material choices for your campaign needs. Please visit our gallery for examples of just a few of the laser engraved products we can offer you. Feel free to contact us for guidance with product selection. Bricks & Tiles: Bricks and Tiles are available in a wide range of colors and sizes. Choose one or select a few to customize your installation and add more appeal to your capital campaign. We offer 4″ x 4″ , 4″ x 8″, 8″ x 8″, 12″ x 12″ and 16″ x 16″ Bricks, Pavers and Tiles from many manufacturers. Boulders & Benches: Commemorate a special event, remember a dear friend, or recognize a high level donor with a personalized boulder or bench. We’ll even provide the boulder or bench! 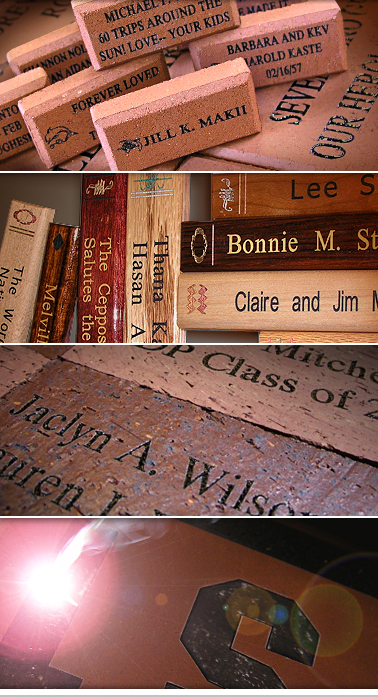 Ceramic Tiles: Ceramic Laser Engraved Tiles can add the element of glazed ceramic luster to your project. Grayscale capabilities and fine line laser marking allow for dynamic graphic creativity. Granite: The beauty of absolute black granite lends commands attention. Grayscale and fine line capabilities provide endless laser engraving possibilities. Consider highlighting your top donors with the elegance and strength of black granite.